Sprouted Green Gram Curry, this is such a simple dish to make as a side dish for chapati. This will be good to eat with steamed rice as well. You can make this curry with whole green gram as well. But using sprout make it more healthier. I have used brinjal along with sprout in this recipe, you can also add potatoes instead of brinjal. Adding coconut gives more flavor to the curry. 1. 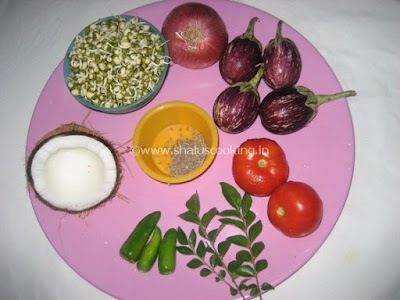 Keep all the ingredients ready to make Sprouted Green Gram Curry. a. Chop the onions and tomatoes. c. Slit the green chilies. 2. Heat oil in a pan and add cumin seeds and curry leaves. When the cumin seeds sizzle, add the onion and green chilies. 3. Saute the onion till transparent, add the brinjals and saute for minute and add turmeric powder. 4. Mix it well. When the brinjal is half cooked, add the tomatoes and mix well. 5. Add salt and mix well. Cook till the tomatoes become soft. 7. Add coconut and cumin seeds to a blender and grind it to a paste by adding little water. 8. Add a cup of water to the curry and bring to boil. Now add the ground coconut paste and mix well. 9. Add some more water and allow it to boil. Switch off the flame when the sprouts are cooked well. Sprouted Green Gram Curry is ready to serve. Serve it with chapati or steamed rice. We are not adding any spice powder to this curry. The spiciness purely depends upon the number of green chilies used. So adjust the number of green chilies according to your spice level.